Deputy Mayor McConnell and Councilmember Robertson were excused for personal reasons. The Mayor proclaimed May as Shoreline Schools’ Music4Life Month. David Endicott, co-founder and Music4Life president, accepted the proclamation. This non-profit program provides ready-to-play musical instruments for students who need them. They supply them without charge to the school districts. Donations of lovingly used instruments or financial donations are welcome. Having them available in May allows enough time to have the instruments repaired and ready for use when school starts in the Fall. Debbie Tarry presented the City Manager’s report. Grounds maintenance crews are beginning training on Aurora. Public Reminder: April 4th at 7:00pm the Planning Commission will meet in the Council Chamber and hold a public hearing: Periodic Review of Shoreline Master Program (SMP). Public comment will be taken. Councilmember Scully advised he will be pushing hard for a central regional body that will coordinate the approach to homelessness when he attends the Continuum Care Council retreat on Thursday. 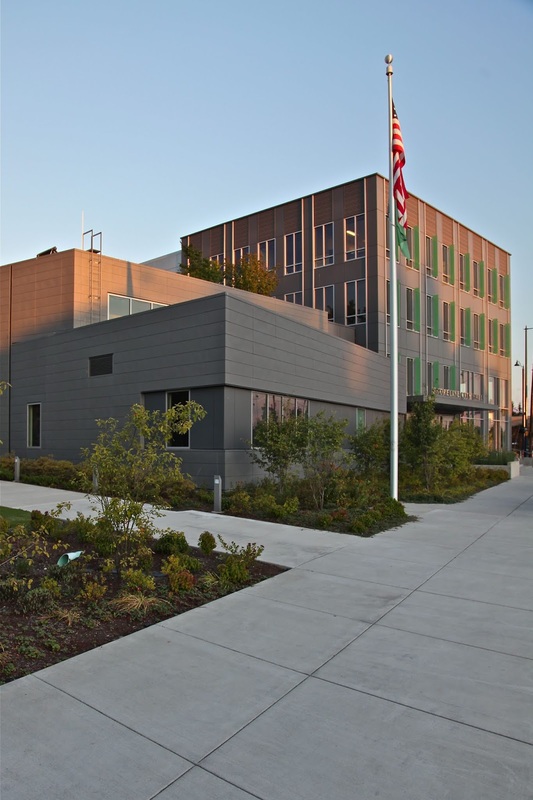 Councilmember Roberts stated Puget Sound Regional Center (PSRC) will provide closed captioning of its meetings. Roberts also visited Olympia looking for financing of the 148th St non-motorized bridge. Mayor Hall met with Seattle City Councilmember Debora Juarez and talked about funding for the 145th St Corridor. Green Shoreline Partnership works to improve green tree canopy and green spaces. Ginny Scantlebury spoke against the Recology Amendment. She wanted to know if auditing containers was legal. Heather Trim, executive director of Zero Waste Washington, spoke in favor of the Recology contract. The Agenda as amended* was approved unanimously. *Item 8b (Approval of amendment to Recology contract) was changed from an Action item to a Discussion item, and 8c (adding changes made by proposed Amendment to SMC) was removed until a later date. Action Item 8(a) Public Hearing and Discussion of the 2020-2025 Transportation Improvement Plan (TIP). The TIP is required by State Law. It includes projects for roads and bridges, as well as for new or enhanced bicycle and pedestrian facilities. Some are funded, some are partially funded, and some are not funded. Listing projects makes them eligible for grants. No projects are being removed this year. New projects are Sidewalk Rehabilitation Program, Ridgecrest Safe Routes to School, Citywide Spot Safety improvements, and 195th pedestrian and bike connector. Mayor Hall opened the Public Hearing. Tom Fortress opposes the 148th St non-motorized (bike/pedestrian bridge). Feels it is unnecessary with another bridge three blocks away (145th) and a waste of taxpayers dollars. Ginny Scantlebury opposes the rechannelization of Meridian Ave. Traffic is already congested during rush hour and parking is being eliminated on Meridian. Nothing is really new except some projects now have funding. Is there a possibility of a non-motorized connection between the Burke-Gilman and Interurban trails? Yes, it is included in the larger umbrella of the 145th St Corridor. Staff will confirm this. Need to add Safe Routes to School for Cascade/Aldercrest as a non-funded project. Is the School District liable if a child is hurt using the Safe Routes to School? The City Attorney has not heard of that. Addressing Mr. Fortress’ opposition to the 148th St non-motorized bridge, staff advised a feasibility analysis was done that showed an increased walk-shed west of the station. There is a significant amount of growth planned for this new neighborhood. It will reduce travel time as well. 148th St was shown to be the most cost effective option. The City has already spent $500K studying this, and thousands will benefit from a 5 minute walk instead of a 15 minute walk (where they would likely elect to drive to the station). And there is a chance there will not be a separate non-motorized bridge at 145th - it might be built into the bridge deck depending on the final configuration of the traffic lanes. On Meridian, Council has concerns about the loss of parking and would like to look at preserving large parts of it. Traffic volume is large because many from Snohomish County use Meridian to get down to 145th. It should be noted that the plan is not to reduce the number of lanes, but add a central turn lane to the one lane in both directions. This was discussed in great detail at the January 14, 2019 Council meeting. So this will be a brief refresher. In March 2015, Council adopted a green building mandate in MUR zones. In April 2017, Council adopted a Deep Green Incentive Program with a tiered structure. In addition to fee waiver or reduction, incentives include exemptions or departures from development standards (density, parking, lot coverage and use etc). Continued parking reduction seems to be creating a mess instead of acting as an incentive. To determine vehicle parking needs in MUR, it was difficult for staff to find current local figures for number of vehicles in relation to income. After some discussion, it was noted that people in the higher income levels have significantly more cars. Unfortunately the data is old and before mass transit stations. To prevent tenants from opting out of paying extra for parking, and using street parking that impacts the neighborhood, SMC 20.50.410(c) states a fee for parking cannot be unbundled from the rental price. Banks will not provide loans if they feel the parking is inadequate. Residents are already unhappy about parking. Prospective tenants will not want to rent or buy without adequate parking. We’re not at a point where people are giving up their cars. On the other hand, these plans cover the next several years (75+). 2b(i): This would make parking reductions for the DGIP cumulative with those for proximity to light rail, but not with those for RapidRide transit or affordable housing. After construction gets going and we see what happens, then changes can be made. If the goal is to incentivize Deep Green, should we increase the parking incentive across the four tiers? In view of the high cost to go from tier to tier, a 10% difference is not enough incentive. Agreed to leave as is and monitor the results. Main motion adopted (as amended) unanimously. This is a follow up to the March 18th Council meeting. China and other countries require a 0.5% maximum contamination for recycling (commonly referred to as China’s Sword). The target for Shoreline is 5.0% maximum contamination. Shoreline is currently at 12-15%. Visual audits would take place twice/year. Recology employees would lift the lid and look, although they might remove a large piece of cardboard if it is on top obscuring the contents. For employee safety, they will not be digging through the bin. If contaminants are seen, a picture will be taken. Ideally, more frequent audits would create quicker results but it would be more costly. Currently the trucks have one driver, and since the trucks are self loading, the driver never sees the contents. If the driver got out to quickly view every recycling container every time, it would be so slow that more trucks and employees would be needed. Audits will be performed in a separate trip by other employees. This is more cost effective than more trucks and more drivers. This is not a punitive income-generating plan. There are no fines imposed if you are tagged. Your contaminated recycling is picked up and processed as garbage at no extra charge to you. You are notified what you have incorrectly placed in recycling so you actually know what you’re doing wrong. Tags are wired onto the handle of the cart so they won’t fall off or blow away. The tag is followed by a letter and a phone call, then a personal visit. You are given second chance. Same procedure. But if there’s a third time, and it appears you just don’t want to bother sorting, then the cost of delivering your contaminated bin as garbage will be charged to you. Ultimately your recycling bin may be removed. This puts the additional cost of non-compliance on the individual - rather than your neighbors. Multifamily locations have the worst contamination. There will be a Waste Wise Program to specially work with multifamily locations. For companies and residents who have low contamination, there is the possibility of winning the Golden Dumpster Award which is a year’s free service. We have to up our game as recyclers. The goal is help residents recycle correctly. Years ago we had to separate recycling into individual bins. There were no lids - everybody could see what you were recycling. At that time there were separate chambers in the truck. The problem was one part (paper) would fill up quickly, so the truck would have to go to the recycling center to get rid of the full load. That was a primary reason for the use of a single bin. We may never recover from this market change. Landfills are full. We cannot send our recyclables overseas, and rates are going to go up a lot if we have to start shipping recyclables by rail to another state. This is largely an education problem. 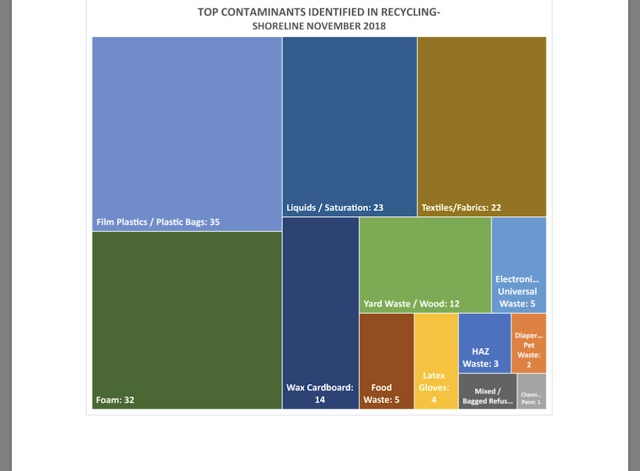 Residents generally want to recycle. Education has to come first and Council would like that beefed up before audits are scheduled. For those who may not read or speak English, the Recology website is translated into the four most common languages in Shoreline, they have bilingual staff, and access to a service which translates. The goal is getting more recycling to the recycling center. This is topic is scheduled for further discussion at the May 13, 2019 Council meeting. The meeting was adjourned at 9:36pm.